Virtual Classroom Breakout rooms allow you to divide any number of participants in your session into smaller teams. Whether you need to give your students an individual exam or have them work on a group assignment, this functionality affords you the possibility to create and customize a separate space for that purpose. Groups (also known as breakout rooms) are separate work spaces in the room. Each one has its own separate room elements: video conference connection, online whiteboard, chat, media player, participant controls – available only for the participants added to the group. 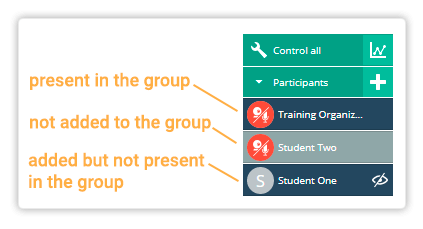 The default group in the room is the Main Group – all participants are automatically added to it. Only tutors can create new groups and manage the participants in them. 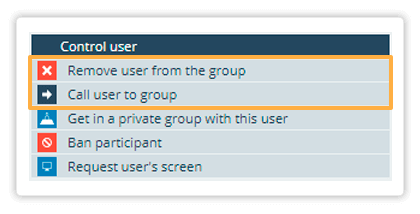 Then type group name, chose the participants you want to add in the group and click Create workspace. If you want you can add a participant in this group straight away by clicking on their name which will move the slider to the right. 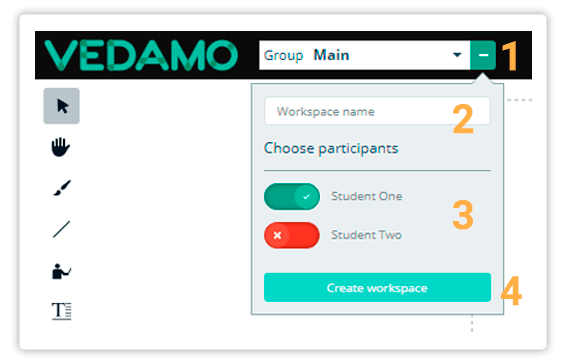 In this example: a new workspace is created with one participant (Vedamo User) added to the group, while the other one (Vedamo User 2) is not added to the group. Press on ‘Create workspace’ to create the group. 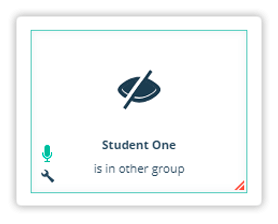 NOTE: You can create empty groups and add the participants later To do this, simply put in a workspace name, set all participants to not be part of the group (similar to Vedamo User 2 in the previous example) and then enter the group. Adding additional participants to the group can be done afterwards and the method of doing that is explained below. Private groups include the tutor and only one other participant. This is a useful feature if you want to give an individual exam to a particular student. Switching Groups is easy – just select the group you wish to go to from the Groups drop-down list. By default the first group is the Main group. It is created when the room is started. NOTE: The Main group cannot be renamed or deleted. NOTE: The tutor/administrator can call a participant to the group. Every group has a separate online whiteboard and the content on it is visible only for the participants who are in that group. NOTE: If you delete the Group all its content will be lost. Select the elements you wish to share in the other group and Copy them. NOTE: Participants can copy or move only their own elements unless they have the permission to Edit All Elements. When granted this permission, they can copy/move any element on the online whiteboard. Every group has its own chat and the content on it is visible only for the participants who are in that group. NOTE: Participants can read messages in the Group chat only while they are in that group. When you switch to another group only the people who are currently in the same group can hear and see you. Every group has its own permissions. NOTE: Some permissions are Global and some are for the Group only. First of all, Enter the Group. Then, there are 2 ways to add a participant to this group: either by using the Control all Participants or through the Participants list. Both ways are described in the next examples. NOTE: You do not have a full list of controls for participants who are not in this group. Once you add them their controls will appear. 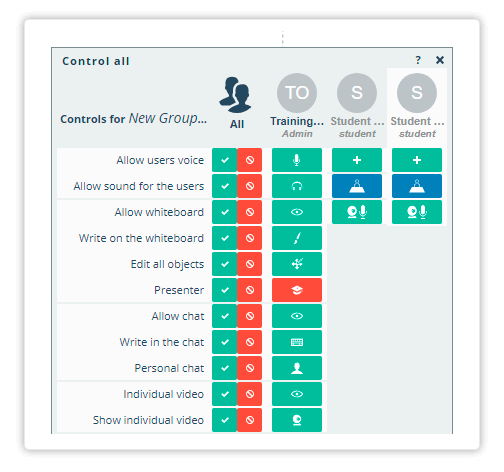 Additionally, two new controls will appear – Remove from group and Call user into the group. NOTE: The participants who are not added to this group do not have controls. Once you add them their controls will appear. Open the Control all Participants and click on the button towards the bottom. Open the Participants list, select the participant you wish to call and click on Call user to group button. NOTE: You should add the participant to the group first. You can remove a participant from the group and add back at any time. Open the Control all Participants and click on remove button (X icon) towards the bottom. Open the Participants list, click on the name of the participant you wish to remove, then click on Remove user from the group. NOTE: The tutor cannot be removed. You can delete any group, except for the Main one, including all their content and settings. NOTE: Once you delete a group, you cannot restore it. To delete a group, open the Groups drop-down menu, then click on the Delete button (X icon) next to the group name. Next up, we’ll take a look at the Synchronize browsing option, which, as the name suggests, allows you to synchronize your view with that of your students during the lesson.